Annie Mackender, funeral arranger for Lodge Brothers of West Byfleet, is always looking for ways to get involved with her local community, so when she heard that St Johns Church West Byfleet were having their Summer Fayre on 11th June to celebrate the Queens 90th Birthday, as quick as a flash she booked a stall. She knew exactly what the event needed to help raise funds for the church… Pimms!!! Annie engaged the help of Linda Bowyer, Surreys Operations Co-Ordinator and set about the task. 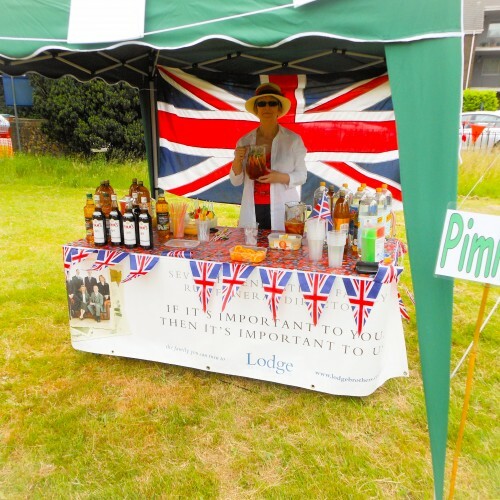 The Lodge Brothers stall offered “Parish Pimms” and “Ministers Mocktails” and only asked for a donation of £2 for the St Johns Church fund, in total £138.00 was raised and even the awful rain didn’t stop Annie’s stall running out of Pimms before the end of the fayre.